The other day, as I was reading The Santaland Diaries on the Tube, I made one of the classic faux pas of Tube travel. I only realised that I had been chuckling out loud, softly but definitely audibly, when I found myself the unexpected beneficiary of a little more room than normal on the Northern Line and noticed that I was being given a few surreptitious glances by other occupants of my carriage. The Santaland Diaries (or Holidays on Ice, if you are on the Western side of the Atlantic) is a collection of six Christmas-related pieces by American humorist David Sedaris. I believe a new edition has recently been published in the United States that includes six more pieces concerning Hallowe’en and Thanksgiving. I don’t know that this works or whether it would detract from the integrity of the Christmas pieces but, generally, I’m all for more Sedaris. Sedaris mixes autobiographical essays with fictional pieces to great effect. I suspect that the autobiographical ones have been a bit exaggerated to make them work – if not, then either his life must have been stranger than the norm or he is a truly gifted humorist. The centrepiece of the collection is the title essay itself. 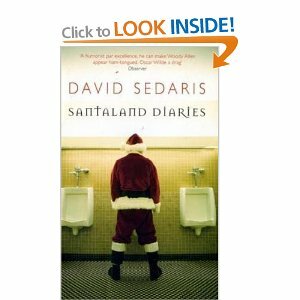 In this, Sedaris recounts his experiences working as one of Santa’s elves at Macy’s in the run-up to Christmas. This is the essay that first brought him to national attention when he read it on NPR and it is wonderful stuff. There is also a nice story about how he and his sister bring a prostitute home for Christmas, giving a whole new meaning to “Ho, ho, ho” (as Sedaris points out). The keys to his anecdotal writings are his tendency to self-deprecation and his essential warmth. In these pieces, he doesn’t make readers feel that they are party to the mocking of others. Although they are hilarious, they are good-natured. The fictional chapters are, although just as hilarious, a bit different in nature. There is a Christmas letter from a suburban mother whose life, it quickly becomes clear, is rapidly degenerating. There is a sermon preached by a cynical TV executive to a rural community, a wonderfully bitchy review of local high school Nativity plays and, finally, a delightfully deranged story about a pair of competitive families who take the spirit of Christmas giving to an unparalleled level. Where his more factual pieces are, at root, gentle and warm, Sedaris lets his wicked side out to play in the fictional pieces. Typically, they start out in an anodyne fashion and gradually lead the reader step by step down a path of increasing lunacy until they reach a gleefully insane and grotesque climax. What really makes them brilliant, however, is that there is a serious idea underpinning each one that makes them almost believable right up to the end. The Santaland Diaries was a perfect first day of my twelve reading days of Christmas, being extremely funny, good-natured enough but with a nice edge to it as a bridge into the season. Having said that, this would be funny at any time of the year and I enjoyed it so much that I have added a couple of his other books to my list for 2011. Tomorrow, for the second day of Christmas, I will be jumping back across the Atlantic to London, EC4 to be precise, where I will be reviewing Rumpole’s Christmas, a collection of Christmas stories featuring Rumpole of the Bailey, one of my favourite literary characters. If you don’t already know him, please do stop by – he is worth it. The Sadaris will make a perfect holiday present for a friend. Thanks. And Rumpole is an old favorite of mine. Can't wait to hear about the book! I'm sure they will love the present! Good to see you are also a Rumpole reader. How can you NOT laugh reading Sedaris? The people sitting next to you should have checked out what you were reading, and all would have been clear.